Sarah Nader- snader@shawmedia.com Jen Wojcik (left) and Brittan Semler run a scene during rehearsal for Richmond-Burton's spring musical, "The Wizard of Oz" on Tuesday, February 25, 2014. 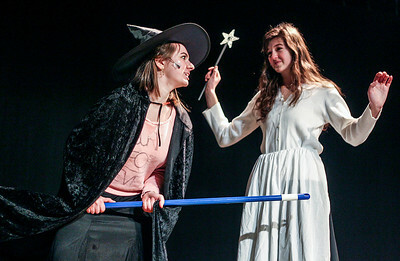 The musical opens on March 6 at 7 p.m. and will also have shows on the March 8 at 7 p.m. and March 9 at 2 p.m.
Sarah Nader- snader@shawmedia.com Rachel Finnes hold the dog that plays Toto while singing a song during rehearsal for Richmond-Burton's spring musical, "The Wizard of Oz" on Tuesday, February 25, 2014. The musical opens on March 6 at 7 p.m. and will also have shows on the March 8 at 7 p.m. and March 9 at 2 p.m.
Sarah Nader- snader@shawmedia.com Luke Gault (left), Jack Ramsland and Rachel Finnes sing a song together during rehearsal for Richmond-Burton's spring musical, "The Wizard of Oz" on Tuesday, February 25, 2014. The musical opens on March 6 at 7 p.m. and will also have shows on the March 8 at 7 p.m. and March 9 at 2 p.m.
Rachel Finnes hold the dog that plays Toto while singing a song during rehearsal for Richmond-Burton's spring musical, "The Wizard of Oz" on Tuesday, February 25, 2014. 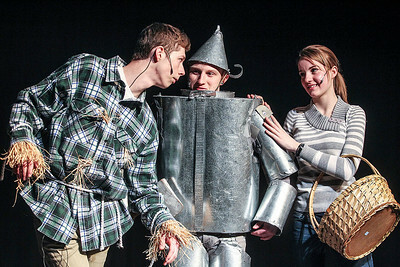 The musical opens on March 6 at 7 p.m. and will also have shows on the March 8 at 7 p.m. and March 9 at 2 p.m.